The Savvy Stamper: Sunshine Sunday - Hey Chickie! This little chickie is Happy Chick from Sunshine's Stamps. Isn't he too fun? He's one of the new spring digi stamps over at the store. I used the sketch from Tuesday Morning Sketches this week. Supplies are SU cardstock in Gable Green, So Saffron. Misc DP from SCWV. I used a SU scallop border punch, Martha Stewart glitter, Cuttlebug swirls embossing folder, SU crystal effects, dew drops, Stickles and other odds and ends supplies. Image is Sunshine's Stamps colored in with Copics and Bic Mark It Markers. Hi Colleen - just chanced upon your blog and have been looking about. Your cards are so colorful and fun! If you enjoy challenges, would love to have you play along at www.justscraps.ca. We just posted a new challenge today. Drop by and check us out! 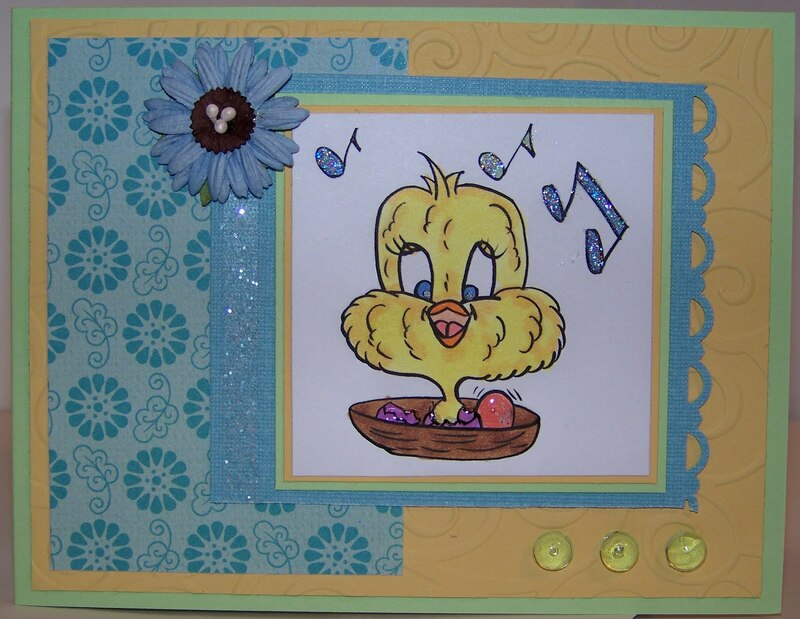 Awesome Happy Chick card! Love that designer paper and those dew drops are perfect with the image. Your colouring is awesome. Great card Colleen!! So cute Colleen! I had to smile looking at that adorable image. Aww, too cute, great color combo! This is just stinking cute!!! CUTE!! This is sooo cute! I love the colors and combo of patterns and textures. Love those colors...those images always make me smile!